More and more experiments are now ‘PC-assisted.’ Also conventional acquisition systems are very expensive. 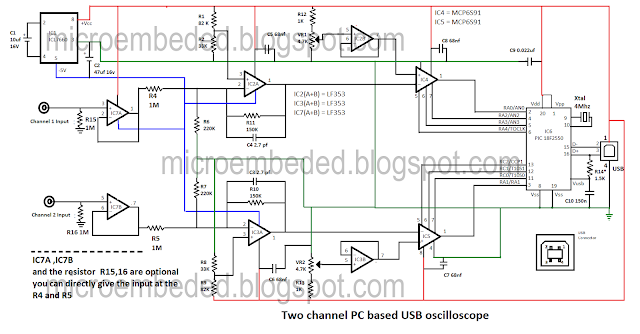 Since portable PCs are today common and a USB link is a better solutionhere we present an oscilloscope using USB port of the PC that operates at up to 10 kHz with ±16V input voltage. It has much more improved features than the PC-based oscilloscope . 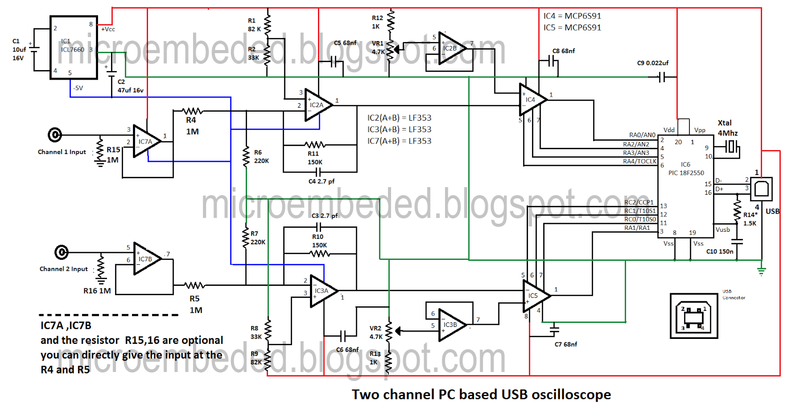 The oscilloscope uses IC PIC18F2550 from Microchip as the main controller, which makes the oscilloscope compact as there is no need of additional power supply for the entire circuit board. modes. In sleep mode, current is down to 0.1 μA. 4. 10-bit ADC module with up to 13-channel multiplexer. This microcontroller has a USB2.0-compliant transceiver and a CPU running up to 12 MIPS. Avobe Schematic shows the circuit of the two-channel PC-based oscilloscope. MCP6S91 from Microchip Technology is an analogue programmable gain amplifier that is well suited to driving analogue-to-digital converters (ADCs) and an analogue input to a PIC microcontroller. Two MCP6S91 programmable gain amplifiers (IC4 and IC5) make it possible to choose the input ranges for each of the two channels, by selecting a gain from 1:1 to 32:1. The amplifiers are small, cheap and easy to use. A simple three-wire serial peripheral interface (SPI) allows the PIC to control them through pins 5, 6 and 7. The MCP6S91 amplifier is designed with CMOS input devices. It is designed to not exhibit phase inversion when the input pins exceed the supply voltages. The maximum voltage that can be applied to the input pin is –0.3V (VSS) to +0.3V (VDD). Input voltages that exceed this absolute maximum rating can cause excessive current into or out of the input pins. Current beyond ±2 mA can cause reliability problems. Applications that exceed this rating must be externally limited with a resistor to the input pin. (pin 3), which is an analogue input, should be at a voltage between VSS and VDD. The voltage at this pin shifts the output voltage. The SPI interface inputs are chip-select (CS), serial input (SI) and serial clock (SCK). These are Schmitt-triggered, CMOS logic inputs. The only disadvantage is that these amplifiers accept only positive signals. That’s why voltage-shifting amplifiers LF353 (IC2A and IC3A) are used,one each for each channel input (see Fig. 1). The LF353 is a JFET input operational amplifier with an internally compensated input offset voltage. The JFET input device provides wide bandwidth, low input bias currents and offset currents. This voltage-shifting amplifier results in a high input impedance and an attenuation factor of 1:4.5. A ±16V input signal is then shifted to the0-5V range when the programmed gain is 1:1. Two halves of the LF353 (IC2B and IC3B) are used as voltage followers to provide a low-impedance shifting voltage (Vref) to the programmable amplifiers. This voltage must be precisely adjusted with two 4.7-kiloohm presets to measure precisely 2.5V level on the inputs of IC2 and IC3 when the input signals are grounded. 2. Command 81h: Receives parameters, and stores the gain-error compensation for the two channels. 5. Command 81h: Receives parameters, and stores the gain-error compensation for the two channels. 6. Command 83h: Initiates a zero calibration sequence of the two channel. Installation of the USB driver. 1. If everything is fine, plug the oscilloscope with a USB cable to your PC (running Windows 98SE or higher version). A “new hardware detected–USB2-MiniOscilloscope” dialogue box must immediately appear on the screen. NOTE:- The driver for this oscilloscope is not for windows 7 or vista. 2. Now you can start the driver installation process. To download drive click here . The goal is to select a good driver (mchpusb.inf) by choosing the ‘specific location’ option. Don’t let Windows take a generic driver by default. 3.When you are done with installation, go to ‘device manager’ and check whether ‘USB2-MiniOscilloscope’ is under ‘other device’ in ‘view devices by type' option. Otherwise, repeat Steps 1 and 2. User interface program and operations. A user-interface software written in Visual Basic 6, called ‘OscilloPIC,’. You can download this sofware click here to download Run the set up program , This will automatically install the ‘OscilloPIC’ user-interface program. Calibration is to be done as described below before reading the output signals on the monitor screen by clicking ‘channels calibration’ under ‘config’ menu bar. Feed the input waveforms (say, sine, rectangular, sawtooth, etc) from the source. Click ‘go’ button. The output waveform will be displayed on the monitor screen. Channel-1 and channel-2 output waveforms can be differentiated by screen and red lines, respectively. By default, the time base is 200 μs per division and amplitude is 4V per division. You can set these parameters as per your requirements. software. Choose the smallest calibration value at ±0.5V for both the inputs. The ‘zero calibration’ command tells the PIC to start its own internal compensation for all calibrations. Don’t forget to connect the inputs to the ground while calibrating. The second parameter to check is the gain error. By clicking the ‘gain calibration’ command, it’s possible to specify a small correction factor. This can be done after several measurements. You have to know the actual levels sine and triangular waveforms and the measured levels (with the cursors) for the two channels. The gain error is less than 0.1 per cent. The number of samples can be set between ‘10’ and ‘500.’ The minimum sampling 10 μs for two channels. assembly on a bread board. 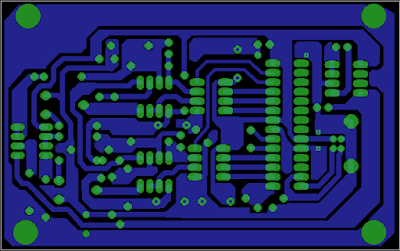 An actual-size, single-side PCB layout for the two-channel PC-based USB oscilloscope circuit is shown in Figure and its component layout . Since the circuit is compact, the construction is easy. 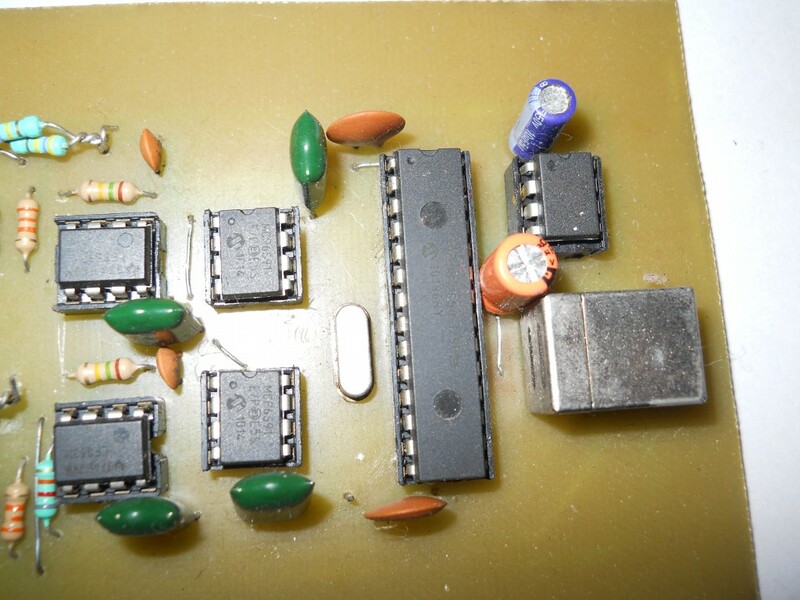 It is advised to use IC bases for mounting IC1 through IC7 on the PCB for easy troubleshooting. The USB connector (CON1) must be firmly soldered and fixed on the board. It is located on the extreme right of the board (refer Figure.). Two BNC connectors can be used for the input signals for channels ‘1’and ‘2,’ respectively. The connectors can be fixed on the front panel of the enclosure. The performance of the oscilloscope can be improved by changing the PIC and its ADC with a faster model. AD9238 (20 MS/s) is a good choice. This fast, parallel ADC converter could be used with a powerful DSP PIC. nice job. I was waiting for this. if any of these components are not available at your place you can ask me ..
hey , thanks for schematic , but i cannot source the microcontroller and opamps , where can i find them in india . i live in remote city so it's impossible to find such devices . Hi and thanks for sharing your project! So the bandwith of this is about 10 kHz? could contact me? 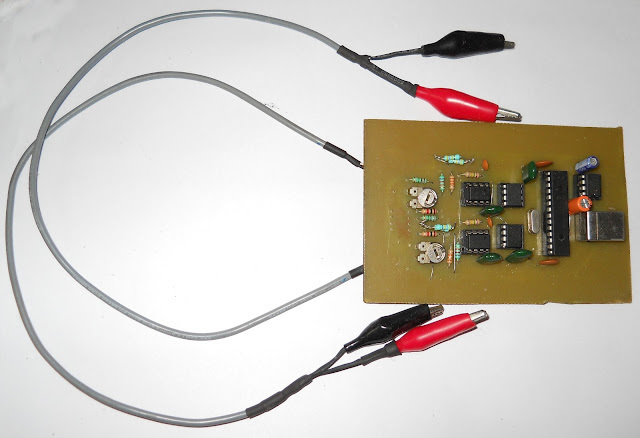 will like to know more about this oscilloscope of the sound card. This is not a professional thing, this is just to learn few working principals. with sound card what will be the max signal voltage?? hi bro do you have any link to buy mcp6s91 or is there any equvalent? Cool project. Is it possible to get the C code you used to program the PIC? can u give me pic codes? will u pleaseee help me. Is the VB6 source code available? HI FRIEND CAN I USE LM358 INSTEAD OF LF353 AND IS THERE ANY EQUIVALENT OF MCP6S91? if you need some part then you can ask me i can help you send me email. What is the highest voltage can be measured in this circuit, you could apply the AC voltage is 220 volts. otherwise pl give me the working kit. pl, help me. hi sir, i am doing hobby electronics, basically B.Tech ECE student. i con't purchase CRO. that's why i am impressing the project. there is no commercial activity. thank you for your supporting. pl give me the price detail of the kit. hi sir, my requirement is ready made kit. it is not available, give me the one set of 1.PCB, 2.PIC18F2550[with code(hex file dump and tested ok)], 3.MCP6S91, 4.LF353. pl give me the price details and SBI bank A/C no. thank you your support. Pl, give me the your contact number cell/ telephone. hello sir..i am a m.tech student..can i apply the same procedure of the above mentioned project for doing the 4 channel digital oscilloscope?if no,can you please help me out in doing this? sure you can modify the firmware code to work as 4 channels. but keep in mind that 18F2550 has limited speed of ADC ~200Ksps. and if you go for 4 channel with this limited speed then bandwidth of such scope will be ~5Khz and due to limited number of sample memory, number of samples also less. sure i can help you doing this. i would prefer to communication via email , chat, skype you can find my email any where on the blog . please try to understand that i can't share my number. its absolutely ok sir...but i didnt find ur email address..can u plz give ur email address..
Best wishes for you work. Sir, im doing my project based on msp430 Microcontroller in order to measure ECG signals. i designed the Visual basic program to get the ADC value from the serial port using microsoft visual basic 2008 express edition. it works nice. what i want is to create oscilloscope in order to display ECG waveform based on value received from the serial port. i want to create my own oscilloscope using Visual Basic. i have seen your work for displaying waveform. 1. Please tell me that " how to create real time waveform graph using VB? 3. There is no tool of waveform chart in this edition. how to add that tool to microsoft visual basic editor? MCP6S91 is not directly replaceable from any other device, ofcourse there are lost of PGA available in the market but to use them you need a little change in the software too. and pinout may also be different. Can you send me (or make public) the VB software? I'm student, and intrested in product, btw, I want to rewrite the software in C#. Why you using MPLAB for coding? Are you aware of MikroC HID library if you aware than why not mikroc compiler? I am also capturing data from two analog channel of PIC18F4553 and further transferring data through USB to PC. Data transferring speed is too low that online I am not able to see data. What will be the problem kindly suggest? Can you do x-y measurements (Lissajous mode)? hello sir i m in urgent need of this project. can i get it from u at the earliest. can you give me the coding for this microcontroller . Thanks for the circuit and info! I'm trying to build it, but I'm having problems calibrating it. The voltage at pin 2 of the MCP6S21 ic's never changes even while I turn the trim pots. The voltage coming out of the pots does change though. Any suggestions as to how to begin debugging this? 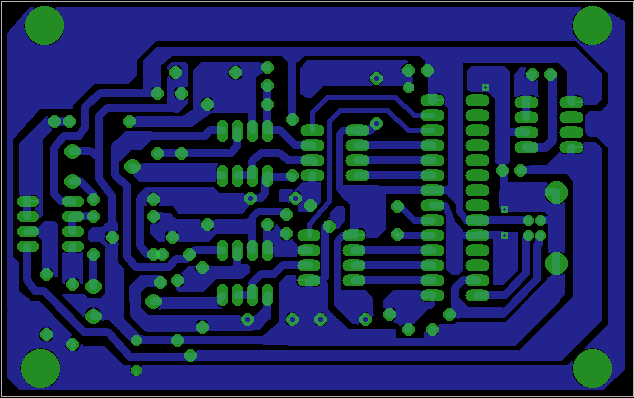 As far as I know, the circuit etched very well and I think that I have all of the components placed correctly. The computer recognizes the device and the drivers are installed. Nevermind! I adjusted the voltage coming out of pin 7 on IC2b and IC3b to 2.5v and it seems to be working fine with that. the visual basic code? please! It would nice if you give the whole thing as a kit !!! This software not work windows 7. Pls give me driver for windows 7.
how to increase the operating frequency greater than 10khz,,and what is the sampling rate to display 10khz signal,how much time it takes for conversion,,why this circuit operats only upto khz,,,,kindly reply me,,its urgent,,bcz am dng this as my main projectin BE final year. can you give me the coding for this PIC. nice....i m waiting for this....is this working fine?? Can u send me schematic pdf on ermihirec@gmail.com..
there is no direct alternative for MCP6S91 , you need to change source for that, you may try to develop or find online some where proteous model for this. dear gaurav chaudhary please tel me the alternative model . i am try to finout alternative model of mcp6s91 from last 2 months but i am fail to findout .please help me . i personally don't have any model for this device. for testing purpose only there may be many other methods that can be used. for example MCP6S91 is an opamp only with digitally selectable gain setting so you can make circuit which have same functionality ,although i won't recommend wasting time that. If anybody need MCP6s91, contact me. I have ordered it and have 3 ic extra. can You help me - how to connect bnc connector? where holes for probe? - it is not marked. Sir can you please send me the code? Thank you. where are the capacitors for crystal? And 4 Mhz is not to be little? you can add two 22pf caps to the gnd if you like to have more stability. Project doesnt work for me in windows 7 or xp. It gives message "OscilloPIC Board not found!" Driver will not work with win 7, the system use microchip USB stack somebody has to update the stack with newer one ‎, then it may work, u can use the circuit with virtual pc or something like that. First u need to confirm that the scope detected as a USB device in device manager. Buenas tardes desde Venezuela, espero que todas y todos estén muy bien, me gustaría saber si alguien pudo hacer funcionar el kit, y hasta que voltajes se puede poner a trabajar, cuanto es el máximo voltaje pico a pico aceptable en cada canal?? les estoy agradecido desde ya, muchos saludos. Hola Mohamed, instala Eagle software y podras apreciar el pcb, alguien tendrá otro software para ver las graficas en la pc que este actualizada? Hi Sir, can I know what software you used to open the PCB file? I am using Express PCB but I can't open the .pcb file provided by you. to make this 4 channel you need to add necessary hardware , change firmware , software. sampling rate capability will be divided into 4 parts. I'm not a good programmer and I'm not interested in the source code. I am interested in why in the circuit pin 7 of the processor is free, and on the PCB pin 7 is connected to +5 volts. If it is an error it may damage the processor. NO pin 7 of the mcu is not connected at all if you look closely at images , i have removed pin7 from socket. 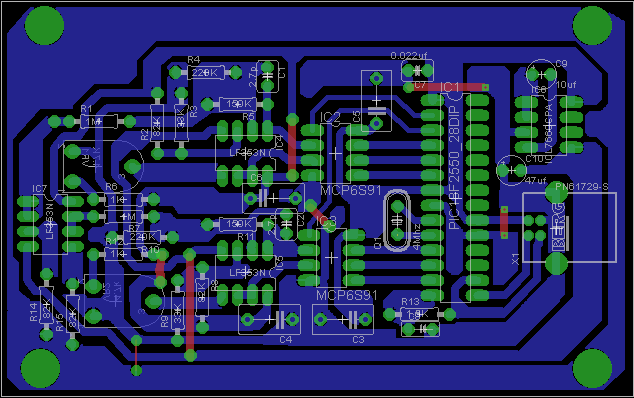 Actually i used this pin area to route 5V around the board. 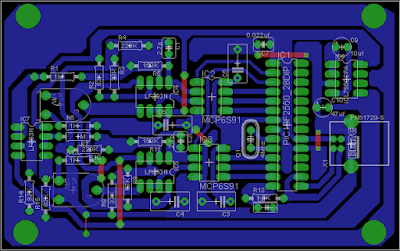 so schematic and pcb both are correct. pin 7 of the mcu is not used at all. Hola, quisiera saber si cada vez que quiera ver alguna representación gráfica en el programa tengo que actualizar o refrescar para verlo o es una falla? por favor diganme si es asi o puedo ver en tiempo real las gráficas? Hello, I would like to know if every time I want to see some graphic representation in the program I have to update or refresh to see it or is it a failure? please tell me if this is the case or can I see the graphics in real time?